End mind, beginner’s mind? 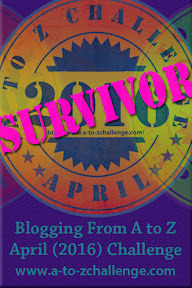 We’re at the end of our challenge for this month, the April A to Z Blog Challenge. Six of the WZG crew participated this month, and we’ve brought you all sorts of content from, well, A to Zen. Thank you for coming along on this journey with us. Why Zen? Why Writer Zen Garden? One of the central ideas of Zen Buddhism is to be in the now. By being fully in the moment, we let go anger about the past and fears about the future, and truly live as we are meant to live. The Zen rock gardens, like the one pictured above, are a visual representation of what being in the flow, or the now, looks like. The rock is seen as a metaphorical obstacle, something we must acknowledge and move around. It causes eddies in our energy, which is represented by the flowing lines in the sand. The more we make peace with that, the more smooth our metaphorical sand becomes and we are at peace. Writing is a little like that. When we talk about writing, we aren’t being fully in the moment and writing. We’re not existing in the now. By learning to sit down and apply the pen to the page or the fingers to the keyboard, we teach ourselves how to get into the flow and to produce. It’s a lesson we must consistently relearn, which is reminiscent of the quote, “Zen mind, beginner’s mind.” Author Natalie Goldberg, who wrote, among other things, Writing Down the Bones, relates a story of speaking with her meditation master. She lamented that she was spending all her time writing, and not meditating. He told her to keep writing, that her writing was meditating. When I decided to start Writer Zen Garden, I wanted a name that embodied this idea of being in the moment while writing. It seemed natural to include Garden, because we are all growing, and we are all living beings. Connecting the three ideas of writing, Zen, and gardening made sense to me. However you found us, I hope you’ve enjoyed your stay here. There are additional resources in the top menu navbar, and we blog regularly. Hope to see you again! Remember, May 9th is the A to Z Reflections Post Day, and the Linky List is open from May 9 to May 13. Keep an eye on the main A to Z Blog Challenge page for more info and updates, and of course come back here on the 9th for our reflections on our collective experience. We do regular Writer Wednesday features here and will be coming up with some other regular features, so keep your eyes peeled. And if you’re a blogger, and interested in contributing, please let us know in the comments. This entry was posted in Blog and tagged #atozchallenge, A. Catherine Noon, Buddhism, Noon and Wilder, Rachel Wilder, Writer Zen Garden, Zen. Bookmark the permalink.